Las Damas Romanas (Roman Maidens) by Juan Luna (The Philippines 1857-1899). Estimate: HK$8,000,000-10,000,000 / US$1,025,600-1,282,000. Photo: Christie's Images Ltd. 2008. HONG KONG.- Christies, the worlds leading art business and the leading auction house in Asia, announces the Fall sale of Southeast Asian Modern and Contemporary Art will take place on Sunday, November 30th at 11am. This sale follows on the heels of Christies landmark Spring 2008 auction in Hong Kong which was its most valuable ever for category. Elements of the theatrical and the dramatic underscore the offerings in this season's Southeast Asian Modern & Contemporary Art sale. A truly outstanding selection of works from modern masters is presented alongside invigorating works of top contemporary artists in a continued endeavor to trace affinities between the past and present, the timeless and the new. Offered alongside works in Christies sale of Asian Contemporary Art, the sale of Southeast Asian Modern & Contemporary Art remains a unique and distinctive element in the art market of Hong Kong and contributes to the full richness and flavour of the art from Asia that Christies offers each season. The Colonial and Modern masters such as Adrien-Jean Le Mayeur de Merprès and Hendra Gunawan continue to draw strong results and record prices at auction. This season Christies will present collectors with several important examples from these artists and others. Leading the selection of Modern works this season is Las Damas Romanas (Roman Maidens) by Juan Luna (The Philippines 1857-1899) [estimate: HK$8,000,000-10,000,000 / US$1,025,600-1,282,000]. This work is one of the truly iconic Roman scenes from the artist, who stands as one of the most important Filipino painters of the colonial period for his reformist stance and the role he played in highlighting the plight of the Philippine colony to the Spaniards. Las Damas Romanas is a classic work in the highest conventions of academic painting. Indeed, the work won a Diploma of Honour at the Munich Art Exposition of 1886. 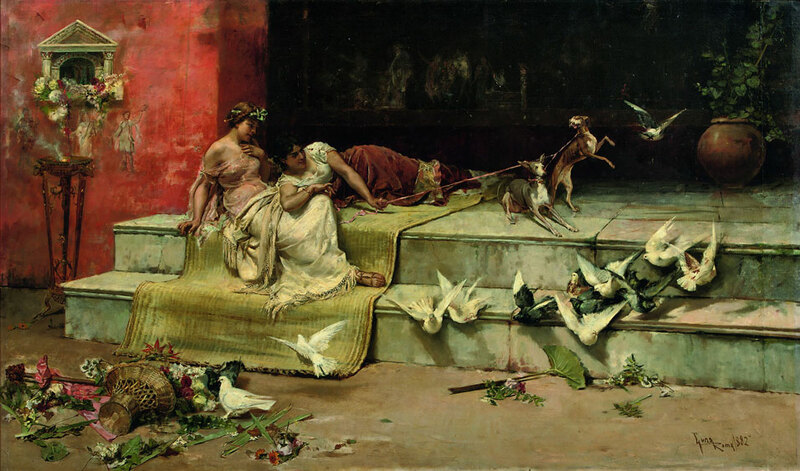 Depicting two Roman girls sporting with their hunting dogs, with flocks of doves symbolizing the divine, this work is in essence a picture of the abundant richness of life, with humankind shown in harmony with Nature. The artist observed and sketched classical Roman architecture and artefacts as studies and Las damas Romanas is a culmination of these observations. Flower Vendors by Hendra Gunawan (Indonesia, 1918-1983) [estimate: HK$650,000-950,000 / US$83,300-121,800] is a strong example of the artists poignant and enduring imagery of Indonesian women. Commonplace episodes are elevated to dramatic heights in Hendras paintings, and this work stands as an enthralling rendition of daily Indonesian life, as flower vendors are some of the most typically-encountered women in ordinary street life in Indonesia. While the artist drew from close observation of everyday life, his female subjects are never particular characters he encountered, but rather figments from his recalled observation that universally bear elegant, undulating, voluptuous frames, and are readily identified as Indonesian by their batik accoutrements. From Adrien-Jean Le Mayeur de Mèrpres (Belgium 1880-1956) comes Balinese Weavers [HK$1,500,000-2,000,000 / US$192,300-256,400], a work that was composed from the veranda of his beachfront house in Sanur, Bali. Arguably the most influential painter to render a particularly romantic image of Bali, Le Mayeurs preoccupation with light and the compositional arrangement of figures and objects makes him a key Impressionist painter who, unlike his contemporaries in Europe, found and developed his visual language in the tropical climate of Southeast Asia. The classic painter-traveller who lived and worked in Bali, he is best known for his Balinese pictures, which are some of the most illustrious in his artistic career. Balinese women bathing, dancing or weaving were subjects that he visited and re-visited over and over again in his lifetime. Further highlights include Splinter Barks, Rimba Seris from the celebrated Malaysian modern artist, Latiff Mohidin (b. 1938) [estimate: HK$200,000-300,000 / US$25,600-38,500]. Rimba translates as primaveral forest. Creatively adapting the visual language of German Expressionism to depict elements of the tropical forest, the work demonstrates the artists typical use of strong colour contrasts coupled with the swift and bold execution of brushstrokes and the simplification of forms. Contemporary Southeast Asian artists are becoming an increasingly sought-after group in todays market and once again the regions key painters such as I Nyoman Masriadi and Ahmad Zakii Anwar and others are represented by strong works. Among the star lots is Marathon [HK$800,000-1,600,000/ US$102,600-205,100], a work that is an exemplary and distinctly theatrical piece from Southeast Asias most successful contemporary artist, I Nyoman Masriadi (b. Indonesia 1973). Depicting five male runners left behind by a speedy female runner, it is a powerful work typifying of the artists thematic interest in competition and rivalry. The world of sports fascinates Masriadi as is evident in the significant number of his images that depict figures as sportsmen and sportswomen. Marathon is a monumental work and one of the largest pieces the artist has done it is a definite crowning achievement for him at the point of painting in 1999 when he was a mere 26 years old and fresh from art school. It is also perhaps the single canvas that best illustrates his longstanding interests in perfecting a painterly rendition of the human figure as well as the use of black. From Ahmad Zakii Anwar (b. 1955), Malaysias key figurative painter today, comes Smoker [HK$160,000-240,000 / US$20,500-30,800], from the artists celebrated Smokers series. The characters in his paintings are the art world's answer to the shadowy celluloid villains of pulp fiction and noir films  like these latter film characters, Zakiis smoking protagonists assume the importance of icons in their own rights. These selfpossessed and inscrutable figures, whose origins, identities and affiliations are not immediately comprehensible, are shrouded in mystery and ambiguity. Indonesian artist Handirwirman Saputra (b. 1975) is included in the line-up by the striking work, Seri Kertas Lipat II [HK$200,000-280,000/ US$25,600-35,900]. The work has emerged from the artists unceasing formal exploration in form and material through his own handcrafted objects. In this way, his practice shuttles between the two-dimensional world of paintings and the three-dimensional world of objects. Christie's continues to introduce younger and emerging artists from this region to a worldwide audience of art lovers. This season sees the works of Thai artist Yuree Kensaku, Indonesian artist Arahmaiani and Bali-based Italian artist Filippo Sciascia for the first time at auction.